Rock’s first female artist, a tragically underrated and overlooked singer who despite being very highly regarded in professional circles throughout her career, somehow failed to connect on a broad basis with audiences, never landing a hit and fading into obscurity in the years since. 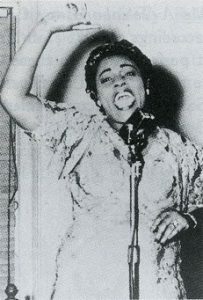 Like some other early rock acts Jones was veteran performer already who’d cut sides with jazz legends like trumpeter Dizzy Gillespie and saxophonists Don Byas and Lester Young, but hadn’t scored commercially and often found her strongest attributes as a singer reined in by conforming to the pre-existing standards fit for the styles that the musicians were adhering to. When she moved into rock ‘n’ roll at its very outset in 1947 her natural talents were given a more welcoming platform and she released a handful of classic sides before a fall from stage in 1951 caused by an inexplicable partial paralysis of her legs left her requiring crutches from then on. With her focus now on regaining her ability to walk her career came to an end, something that with little commercial success to show for her work and facing a future in a style that was skewing ever younger may have been inevitable before long anyway. Though her legs never fully regained their full usage, she eventually made it back to doing some live performances in later years but her recording career was long since over, taking with her one of the greatest and most expressive voices the idiom had seen. Despite her groundbreaking role in rock history Jones was little remembered when she passed away in 1989 at the age of 74.